Two potentially dangerous dogs are seized in London every day and this could rise during summer festivals, the Metropolitan Police has warned. A report to the Metropolitan Police Authority said the Notting Hill carnival, Peckham Rye and Brockwell Park fairs could trigger more seizures. The summer events could also lead to dog violence, the report warned. The Met has now set up a unit to tackle "weapon" dogs. Last year 719 dangerous dogs were seized in London. The rise in dog seizures meant £1.3m of taxpayers' money was spent on housing 302 dogs in kennels. Analysts from the Met found a strong link between knife crime and dog fighting. Police have focused on 10 boroughs including Croydon, Newham, Hackney, Southwark, Haringey, Lambeth and Lewisham. 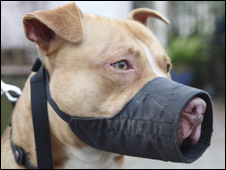 The Met has now joined forces with the Greater London Authority and local councils to form The London Dangerous Dog Forum (LDDF) to tackle the issue. Calling for "tough legislation" and a "hard-line approach" Kit Malthouse, deputy mayor for policing, said breeding and selling "weapon" dogs are as alarming as knife or gun crime. "No less dangerous than a knife or gun, yet paradoxically harder to control - they often terrorise whole neighbourhoods, inflicting injury and killing pets and, tragically, sometimes people. "That their numbers are rising rapidly should ring alarm bells across government. "Make no mistake, these unfortunate animals are potential killers and we should treat them as such," he said. Last month, animal charity RSPCA said the capital was the country's hotspot for dog fighting where the animals were used as "weapons" resulting in the dogs suffering stab wounds, cigarette burns and broken bones. It said incidents of dog fighting had increased to 284 reports in 2008 from 24 in 2004.